The Python Round function is one of the Built-in Math function which is used to round the specified expression or an individual number to nearest integer. In this article we will show you, How to use Round() function in Python Programming language with example. Number: It can be a number or a valid numerical expression. If the number argument is positive or negative number, Round() function will return the nearest value. Digits: This is optional parameter. If you omit this argument, Round() Function in Python will round the Number to nearest integer value otherwise, Number is rounded to decimal value specified in Digits arguments. At the beginning of this program, We declared a Python List and Tuple with some random values. The First two statements of this program, We used the Python Round Function directly on both the Positive decimals and negative decimals. 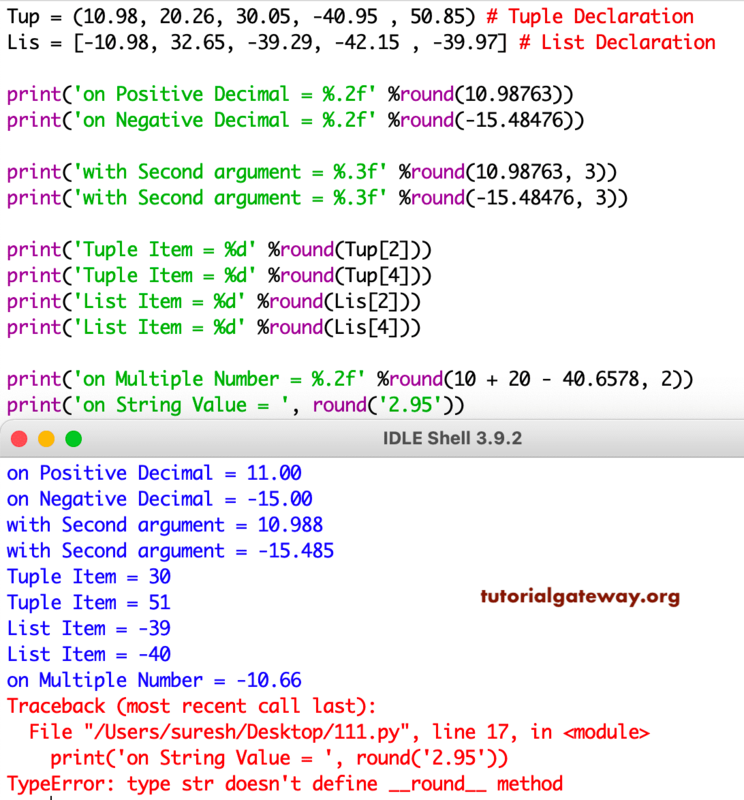 Next two statements, We used the Round() Function with two arguments so above statements will round the given numbers to nearest decimal value at third position. Next four statements, We used the Round() Function on Python Tuple and List items. If you observe the above screenshot, Round() function is working perfectly on them.